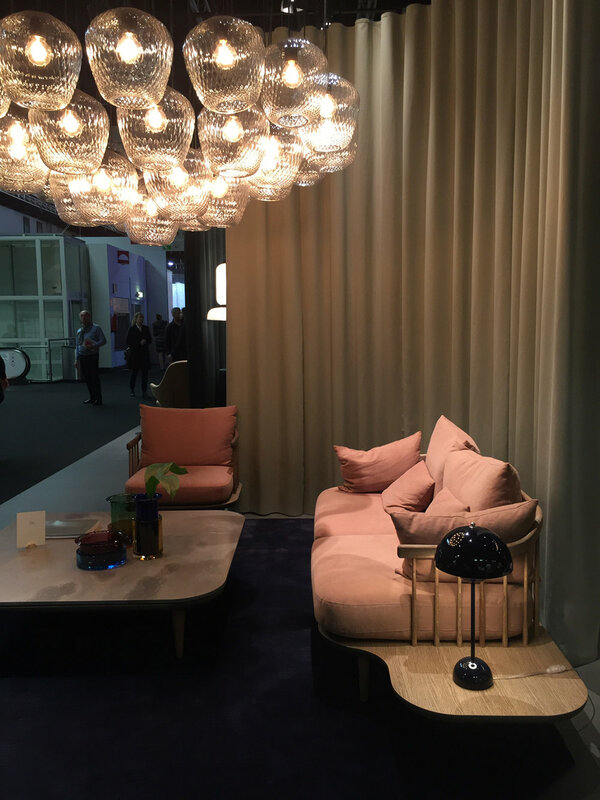 18 Interiors Trends for 2017 "Fashion Comes Home"
I have great things to share with you now that I'm back from the and after spending two very full weekends there. I worked with a film crew to do videos for the fair which has become my new favorite thing to do! But of course, my focus was my booth and in presenting a cattledogs styled space to visitors and to tell them about me and what it is that I do. I feel in many ways, I accomplished this but so many things I would change but now I know for next time so even though the stand was a success and the fair had 150,000 visitors, I have learned so much from this experience and can't wait to work on my next fair stand. If you want to see before and after photos, . Are you ready to see what I saw at the fair and to do some trend spotting with me? Here's my list of 18 interiors trends for interiors that I spotted. If I had to summarize the direction of interiors in Europe at the moment I would simple say, "Fashion Comes Home". I really see fashion making its way into the home sector with the revival of individualism, texture, fabric and luxe materials and patterns. 1. Antique-effect mirrors that are not Shabby Chic, but very moody and dramatic. and come to mind. 2. Grouping pendant lights instead of hanging just one. Grouping definitely creates a mood as well as impact. The lighting above shown was in the stand of . 3. Velvet seating is experiencing a big comeback. I saw examples of this all over the fair, sometimes using just a chair as an accent, other times an entire room. The purple seating above was in the stand of . 4. Curtains. I saw lots of stands using lengths of fabric as room dividers to mimic curtains. Semi-sheers and some very lightweight that almost looked like netting. Others more dramatic and bold in lush materials. There is a huge revival in fabrics for interiors at the moment. Example above as shown in stand and . 5. Painted walls. White is definitely not trending right now on walls here in Europe. Walls need to be in color - and mostly bold moody tones. Examples above as seen at and stands. 6. Multi-colored walls. Individualize your home. This stood out to me the more I browsed the fair. One way was repeated throughout the fair and it was through color. One color on the walls in an entire room feels dated to me after visiting the imm. The new goal is to use different colors on your walls or paint the walls in unique ways with more than one color (such as 3/4 of the way up, one color, and the top, another). Being playful but still maintaining a sophisticated vibe. 7. Luxe materials and texture. Marble and colored glass are definitely on trend. Velvet, leather, linen, crystal, wool, anything that makes you want to touch it. Example above from . 8. Colored surfaces. White and wood are classics, but companies are asking us to live a little. Buy a dining room table with a navy blue top or a kitchen unit in pale blue. Or maybe an emerald green side table? A coffee table in pale yellow? Try to break away from the classics at the moment and be more open to mi color into your foundation pieces, not just your accents. 9. Colored frames. Or mix the frame colors. offers this with their new and I love it. 10. Layering rugs. This is popular too. Lay down a rug and add another rug on top, and maybe another trailing off, and create a patchwork of rugs if you like. It's also a practical solution if your table is larger than your rug. Just add more rugs. 11. Pastels with black. Grounding pastels with black is very important and I saw lots of examples of this - black seems to bring pastels into the adult zone and out of the teen zone. Also, mi in red or bright orange. Great example of this was spotted in the stand. 12. Bold lighting. Lighting that makes an impact is very important right now. Nothing above your table should be boring! I saw examples of this over and over again. Lights that make you stop and stare. Go for those. Same for floor and tabletop lights. The sky is the limited! 13. Kitchens that bring chef's technology to your home. I saw so many examples of this with integrated stovetop ventilation, vacuum-pack drawers in ovens, appliances that use voice command, coffee makers with wifi, black stainless steel, mobile kitchens, rethinking your refrigerator (built in under counters or in the wall vs. huge free standing unit), touch activated faucets, Alexa-enabled appliances, faucets in bold colors, you name it. You can live like a professional chef at home with the options that are out there right now. Kitchen above is from , notice the raised sink, so interesting right? 14. Modular and multi functional furniture. Sofas, tables, it should all have more than one way to use and enjoy it. It can be repositioned, used to work, to play, to sleep, to accommodate guests, etc. had a great sofa in her stand that shows how nicely this can be accomplished. 15. Metal. Metal is huge, it's everywhere. Frames, legs, lighting, kitchens, everything - but way more understated and matte than before, not so much bling. 16. Mirrors. MIRRORS are BIG right now. Especially round ones and those that are shaped a bit unusually. I love mirrors in the home, so this is a trend that never goes out of style to me. 17. Bold Tones. Color is big right now but not the typical saturated hues like pure red, blue, violet... The colors are definitely more moody and shaded. Imagine adding black to pure red, or black to blue... Or adding gray to yellow or green. Cozy colors are what I predict we're moving towards for the year. 18. And a micro trend... Air plant holders! People were going crazy for these over at the and Desiree even had them in her booth. Air plant holders are seriously all the rage at the moment, particularly the ones from . 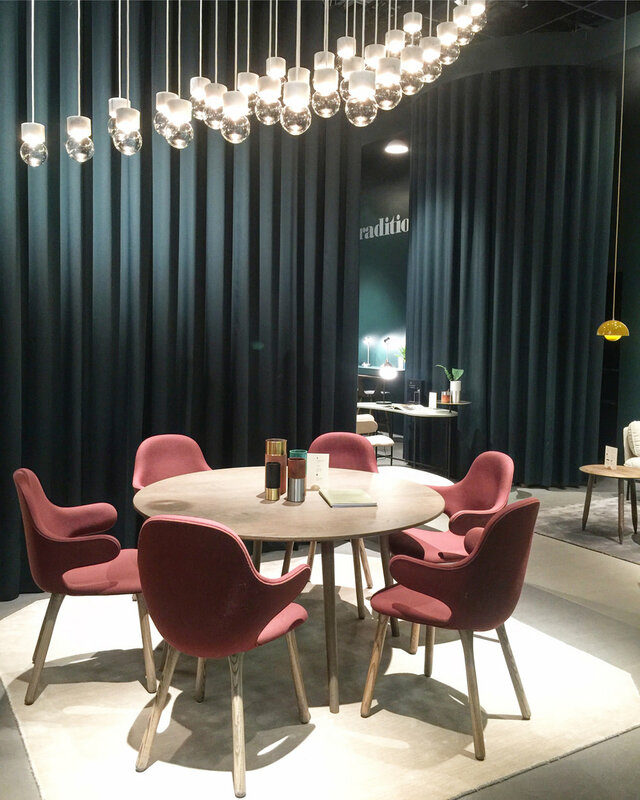 I hope you've enjoyed my trend report from the imm Cologne and Living Kitchen. Which trends do you like most?? ?